At 11:10 p.m. on September 7, 2011 (Nepal time) Khensur Rinpoche Lama Lhundrup passed away in Kopan Monastery. At the time all the monks and Lama Zopa Rinpoche were doing Heruka Lama Chopa puja for Khensur Rinpoche Lama Lhundrup. 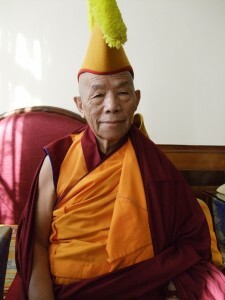 Lama Zopa Rinpoche is requesting all the FPMT centers and students to please do Medicine Buddha puja (extensive, middle length or brief – whatever can be managed). At this time Lama Lhundrup is meditating peacefully in his room.